Easter is JUST around the corner (I can hardly believe it) and this year we’re hosting both families! We’re having J’s family over for an Easter brunch of sorts (and egg hunt for the littles!) on Saturday, and my family is coming over for an early Easter dinner on Sunday. As you can imagine, I’m trying to plan out my menu for both days, and high priority was coming up with a healthy (but delicious!) carrot cake recipe. Years ago, I started baking the Easter carrot cake with my grandma—so for me, the task of fiddling around with ingredients was nostalgic in all the best ways. I honestly don’t eat carrot cake throughout the year, but I love it on Easter. For me, it’s the equivalent of a good pecan pie on Thanksgiving; I never eat it except for Thanksgiving—and then I really enjoy it! 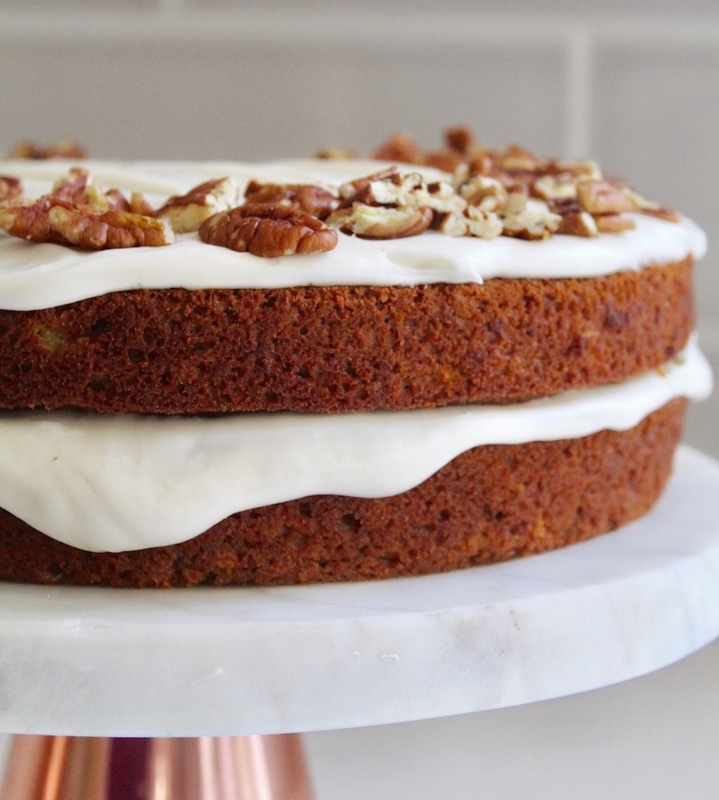 Finally, a good carrot cake has a bright, tangy cream-cheese frosting. Not too sweet (because the cake is sweet). And for best results: cakes are made a day (or even two!) before Easter and kept in the fridge (covered), so the flavors have a chance to come to life. This carrot cake recipe isn’t the same as eating a kale salad—I just want to clarify—but it is healthier than a traditional carrot cake. But don’t worry: even though it’s healthier, you’ll still end up with an incredibly flavorful, moist, delicious cake to show off! This cake doesn’t have any oil or butter (it’s kept moist with unsweetened applesauce and chopped pineapple). It’s absolutely delicious and I know you’re going to love it! Note that for decorating the cake, I opt for a layer of cream cheese frosting in between each layer. I don’t frost the outside of the cake. You’ll want to double up on the recipe if you plan on icing the whole thing. Preheat the oven to 350-degrees F. Use a liberal amount of butter or coconut oil to prepare two 9-inch cake pans. Set aside. Chop 1 ½ cup pecans. On the stovetop, heat a small nonstick skillet over low-medium heat. Add in the pecans and turn frequently. Toast them—about 3-4 minutes—until they’re fragrant. (Be careful not to burn them.) Then, remove them from the heat and set them aside in a bowl to cool off. Chop pineapple and set aside. In a large bowl, combine the flour, baking soda, salt, cinnamon, and nutmeg. Mix using a fork or clean whisk. In another mixing bowl, combine applesauce, vanilla extract, brown sugar, and granulated sugar. Add in eggs, one at a time. Blend on low (using a handheld or standing kitchen mixer) until just incorporated. Evenly divide the batter between the two prepared cake pans. Bake for 35-45 minutes (until a toothpick inserted into the center comes out clean). While the cake is baking, prepare the cream cheese frosting by blending together the cream cheese, butter, powdered sugar and vanilla extract. Chill in the refrigerator for a stiffer frosting. Let the cake cool for a few minutes before removing each layer from the pans. Then, when the layers are nice and cool (I wait at least an hour), frost them directly on the stand you intend to serve on (or on a round portable cardboard piece for easy movement). Top with remaining crushed pecans. Store in the refrigerator and enjoy!